Update September 2016: No need to change the content below, still up to date, just adding the Make Money Fast article SEO advice links perfectly in to the relatively new Google RankBrain algorythm. RankBrain is part of the latest Google organic search engine algorithm, it’s Google’s latest attempt at AI (artificial intelligence), or to me more precise machine-learning AI (it’s not true AI). To simplify, Google has an AI that can guesstimate what a user was actually searching for. Here’s a simple example, humans know a search for Make Cash Fast is the same as Make Money Fast, Make Dough Quick, Create Wonga Speedily etc… well so does Google. In this WordPress money making SEO lesson I’m going to teach how to target significantly more search engine traffic from one WordPress post using the Make Money Fast Google searches as an example. Though this SEO guide is about how to target more SERPs on one webpage, I’ll be targeting this pages SEO at Make Money Fast keyword searches to illustrate exactly how to optimize a WordPress post for multiple related keyword phrases. If you own a website with a lot of WordPress posts by converting your SEO approach to the one I describe below you could make a lot of extra money fast from increased search engine traffic. I’ve seen traffic over double using this advanced money making SEO technique. I included reference to my main SERPs in the top content, basically using the main phrase at least once. The theme I use automatically adds a H1 header with whatever the title tag of this webpage is. This is basic SEO 101. Above is a H2 header with a related SERP, H* headers add additional SEO value to the text. This is basic SEO 101. Make Money Fast as a website niche has a nice chunk of Google traffic, according to the Google AdWords Research Tool the single phrase “make money fast” generates around 27,000 searches a month. Above is an image filename make-money-fast.jpg and alt text “Make Money Fast”, adding additional SEO value to this webpage. This is basic SEO 101. The top 6 make money fast phrases could generate up to 40,000 search engine visitors a month. Unless you are only targeting really long tail keywords (long phrases, not a lot of traffic) you’ll find these sorts of figures through every website niche. If you were targeting the top traffic SERP Ways to Make Money (60K visitors a month) you could potentially over double the traffic by also targeting the keywords: Easy, Online, Quick, Extra and Home. It’s surprising how few websites use this derivative SERP traffic targeting, with more search engine traffic a website tends to make more money online. You’ll see why I’m listing 6 keyword phrases later. Above is an H3 header with a related SERP, I use multiple H3 headers this way. This is basic SEO 101. With most WordPress setups you are limited to effectively targeting one main keyword phrase per post, the reason for this is you have no control over how internal links point to your WordPress posts other than manually linking to related money making webpages which is time consuming. 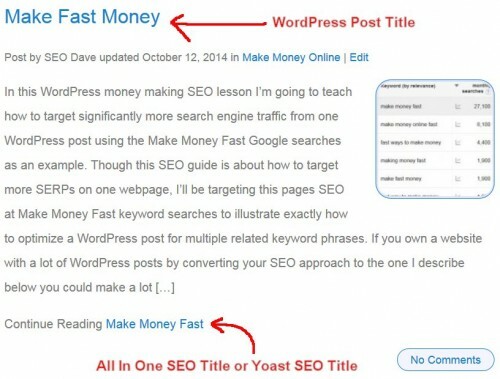 When I wrote this post I gave it a WordPress post title “Make Money Fast”. Above is an image filename make-fast-money.jpg and alt text “Make Fast Money”, adding additional SEO value to this webpage. This is basic SEO 101. If I ran this site using a basic WordPress theme (TwentyFourteen, Genesis, Thesis for example) all internal links anchor text would be “Make Money Fast”. A best case scenario would be the anchor text of popular posts widgets, recent posts widgets, links from category archives, tag archives, home page archives would all use “Make Money Fast” as anchor text. That’s best case scenario, many themes will use “Continue Reading” or “Read More” for some links anchor text which adds no SEO value to the link! If your WordPress theme adds “Continue Reading” or “Read More” links it is NOT a WordPress SEO Theme. A real WordPress SEO expert would not develop or use a theme which doesn’t optimize internal anchor text. 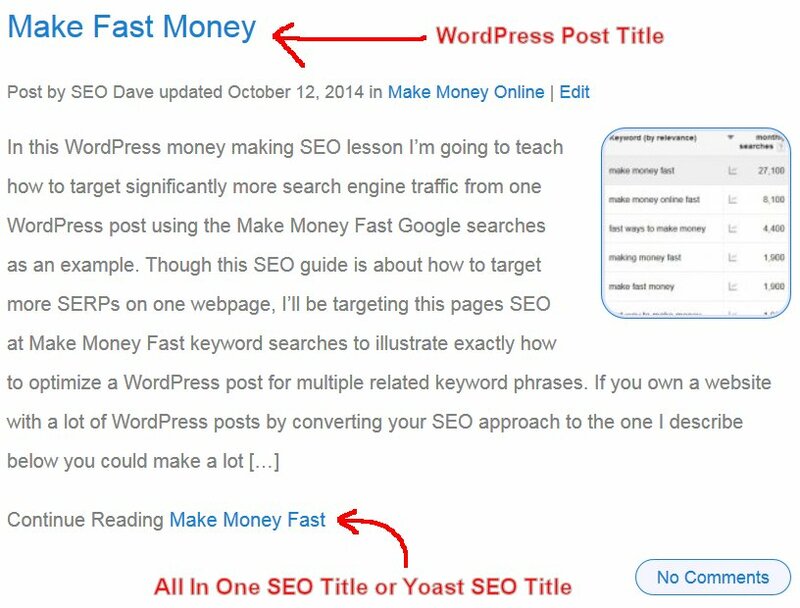 Even if you used a WordPress SEO plugin like Yoast WordPress SEO or All In One SEO and set a title tag to say “Make Money Online Fast” all the internal links would still be using anchor text “Make Money Fast” (or “Read More”!). None of the SEO plugins change the anchor text of internal links: I don’t know why the developers consider their plugins the best WordPress SEO plugins? All the average WordPress theme can optimize for is at best one phrase per WordPress post. To optimize for multiple phrases would require manually adding internal links using different related phrases like fast ways to make money (possible, but time consuming). 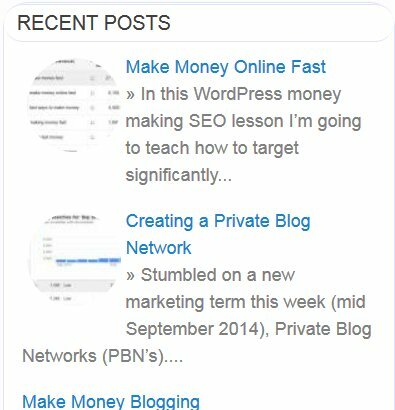 Or create multiple WordPress posts each targeting one SERP each, again possible, but why create 6 posts when one or two can achieve similar traffic targeting? With our “Make Money Fast” SERPs with your average WordPress setup you are directly targeting one main SERP with 27,000 searches a month, that’s it. 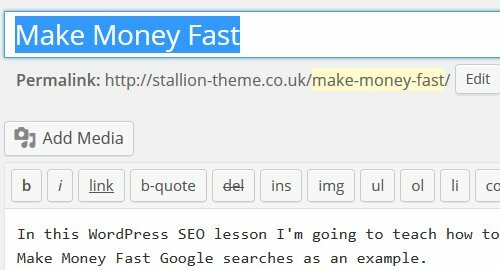 Stallion Responsive is the only WordPress SEO Package that can target 6 phrases per WordPress post (now you know why I listed 6 keyword phrases). 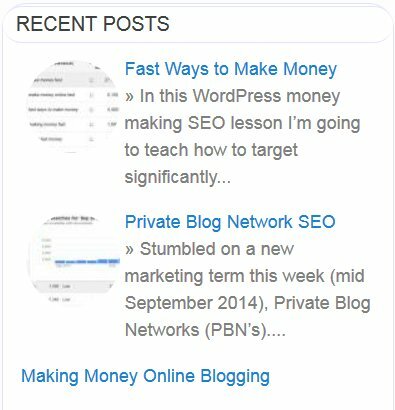 With the 6 Make Money Fast SERPs listed earlier I have optimized this WordPress post to target them all, this post is targeting around 40,000 searches a month rather than 27,000. Obviously I still need to work on off-site SEO factors (backlinks: without links none of this will work) for these SERPs, but 95% of the on-site SEO is done after I click the Publish post button. I wouldn’t normally target the first 6 phrases from a SERP set, but this is an example post to show how to achieve money making SEO changes and it’s an easy example to explain/follow. Normally I’d look for 6 related phrases, that sort of mean the same thing: this links in with the Google Hummingbird algorythm. How to use your 6 keyword phrases? Stallion Responsive uses the 6 keyphrases as the anchor text for internal links and for other important SEO factors. This is achieved using a unique Stallion Responsive SEO feature which on every WordPress post edit screen 6 phrases can be added: one of the phrases is the default WordPress post title like you see with all themes, another is either the Yoast title tag or the All In One SEO title tag (Stallion will use Yoast plugin or the All In One SEO plugin title tag data format: you don’t need these plugins installed, Stallion uses the same format, but has it’s own options) and the remaining 4 are Stallion Responsive keyphrases (unique SEO feature to Stallion). Above is an image filename make-money-seo.jpg and alt text “Make Money SEO Package”, adding additional SEO value to this webpage. This is basic SEO 101. Below I’m going to show how the 6 keyphrases are used within the Recent Posts widget (built using the Stallion SEO Posts widget). First screenshot is from the home page. You can see the 1st link (to this webpage) uses anchor text “Making Money Fast” which is the “All In One SEO Title”. Next screenshot is for the Make Money Online Category (the WordPress category this post is in). You can see the 1st link (to this webpage) uses anchor text “Making Money Online Fast” which is “Keyphrase 1”. Next screenshot is for this post Make Money From Public Domain Content which is also in the make money online category. You can see the 1st link (to this webpage) uses anchor text “Fast Ways to Make Money” which is “Keyphrase 2”. This is just one example of how the 6 keyphrases are used. If this webpage becomes popular and becomes listed in the Popular Posts widget other keyphrases will be used for those links. Go to the Make Money Category and find this post and note the the anchor text of the two links back here. 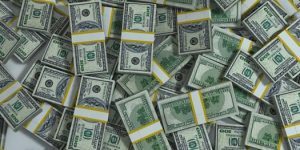 When this article generates large comments they will link back to this post from the Stallion SEO Super Comments pages, the Comment on link will use anchor text “Make Money Fast” (the All In One or Yoast SEO title tag). After you’ve setup your 6 keyphrases and built your sites widgets etc… 95% of a WordPress posts on-site SEO is done. The remaining on-site SEO is manual, as you create new posts or edit old ones link to relevant posts contextually (within the body text). 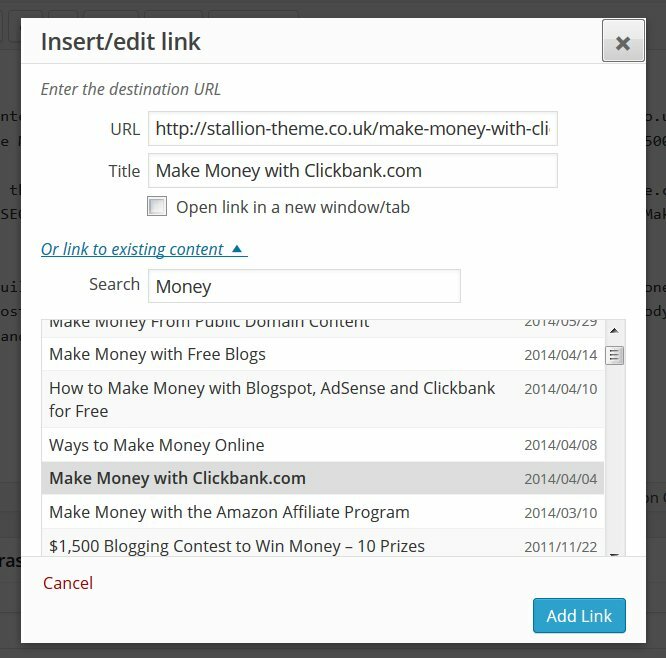 As I wrote this post I manually added related links (and some not so related) using the WordPress “Link” button like this Make Money with Clickbank link which includes the two important keywords “Make Money”. When I edit posts related to making money I’ll add contextual links to this webpage as well, so if I edit the Clickbank page I might link here contextually. This helps your on-site SEO, helps with my top 5 ranking for the “Make Money with Clickbank” SERP for example. To actually gain these SERPs your next SEO task is generating related backlinks from other websites, now that’s the difficult part :-) At least you don’t have to think too much about the on-site SEO with Stallion allowing you to concentrate on off-site SEO factors. This question probably goes back to SEO 101, so forgive me, but maybe some other person new to SEO is unclear on this. I would really like the Post Title to be “Corporate Events – A Unique Guestbook Idea” just to clarify what the post is about and I want to add a few additional words to help clarify but they are not exact matches on any of the phrases I found using the Google Adwords Keyword Planner. Because if look up that phrase that I want to use as the Post Title in the Keyword Planner, it is too specific and nothing comes up. So does that mess everything up? Do I have to keep the Post Title as an exact match from a phrase in the Google Adwords Keyword Planner. Or can I add extra words and change some of the order as long as the keywords are in there somewhere? That’s a really good question and one you’ll struggle with for each article as your optimize it. By trying to keep to the exact matches your webpages will be better optimized than most. As I think you’ve realized for maximum traffic targeting you should use the exact matches, BUT these aren’t always the best phrases for users: take users into account as well. If an exact match doesn’t provide enough details for a potential visitor to think “yes, I’ll click that Google search result” add qualifying text. If you think your potential buyers are more likely to click a Google SERP title “Corporate Events – A Unique Guestbook Idea” you should use it (add to the All In One SEO Title form). Remember every additional word you add to the phrases (especially the All In One SEO (Yoast SEO) Title since that’s the most likely** phrase Google will use as the title for your search engine results) will mean you need more off-page SEO (that would be more backlinks) to obtain the main SERPs. It’s a balancing act between perfect SEO and user needs, generally speaking more you concentrate on users more off-site SEO you’ll need (more backlinks). ** Although Google tends to use the title tag for the title of SERPs, it doesn’t always use the title tag. The ” – SEO Dave” part is what Google thinks my site is about (I planned this), generated this without having to add SEO Dave to the title tags by having my comment author links link back to home with anchor text “SEO Dave”. If I changed my author name to “Awesome Dave” Google would most likely change the results to “SEO Tutorial – Awesome Dave” :-) This works because I have a lot of comments, there are more links back to home due to my comments than any other internal link. So the webpages title tag is “SEO Tutorial”. The page found is the same page for the SEO Tutorial search, but Google has taken another SEO metric into account to decide what the SERPs title should be. Google does this because of the anchor text of links, I have incoming links (from other sites) using mostly SEO Tutorial as anchor text, doubt I have many using SEO Tutorial 2014 though. What I do have is a fair number of internal links using anchor text “SEO Tutorial” and “SEO Tutorial 2014” (in 2015 I’ll change them to “SEO Tutorial 2015). Google is looking at the distribution of links anchor text and determining relevant SERPs titles. I think you’ll agree a user searching for “SEO Tutorial 2014” is more likely to click the “SEO Tutorial 2014” title than the “SEO Tutorial” title. Searching Google for all 6 of the keyword phrases find the SEO tutorial top 20, keyphrase 4 is “Google Panda SEO Tutorial” and one of the paged comments https://stallion-theme.co.uk/seo-tutorial/comment-page-4/ is top 10 with SERP title: Google Panda SEO Tutorial. Google Panda SEO Tutorial isn’t a phrase suggested by the keywords tool, that’s for users. To summarize, the exact match is best for SEO, but also take your users into account as well. 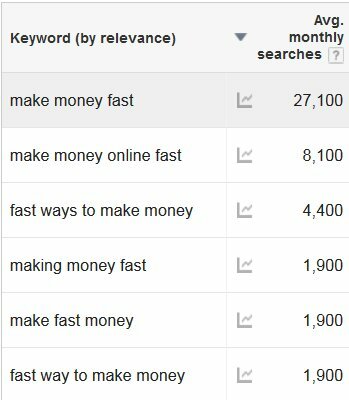 My Make Money Fast post is a simplified example to show the concept, just knowing how the keyphrase feature works and having the AdWords keywords research tool open as you write/edit posts will have a major impact on how much traffic you’ll be targeting. 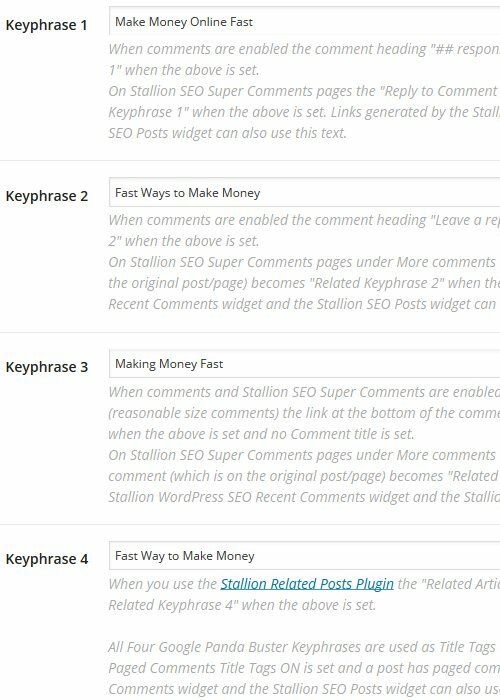 In the main make money fast article I explained how to use the 6 Stallion Responsive keyphrases to target more traffic for each WordPress post, so we can make more money faster. 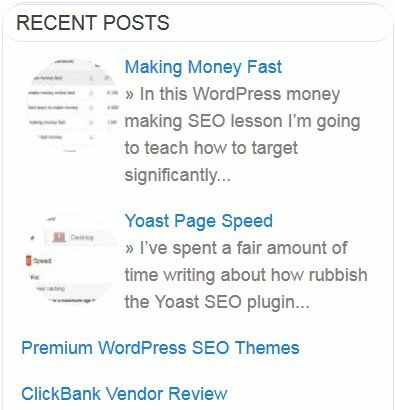 In this comment I’ll teach how to write SEO’d comments to support the main WordPress posts SERPs (Make Money Fast SERPs) AND generate long tail keyword SERPs directly from the comments. Stallion Responsive includes the SEO Super Comments feature which along with a bunch of other SEO features generates SEO’d webpages from larger comments Google spiders, indexes AND ranks in their own right (I have a lot of traffic due to comments). 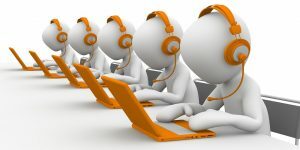 When I wrote this comment I set a Comment Title: “How to Make Money on the Internet”. The comment title will be used as the anchor text of the link (see bottom right hand corner of this comment) to the SEO Super Comment page and as that webpages title tag and H1 header. This is basic SEO 101 for any webpage you want ranked in Google, simply by thinking SEO when writing or editing comment titles you can gain SERPs with comments: consider editing your visitors comments with no or not so good comment titles (can make a big difference to your sites on-site SEO). 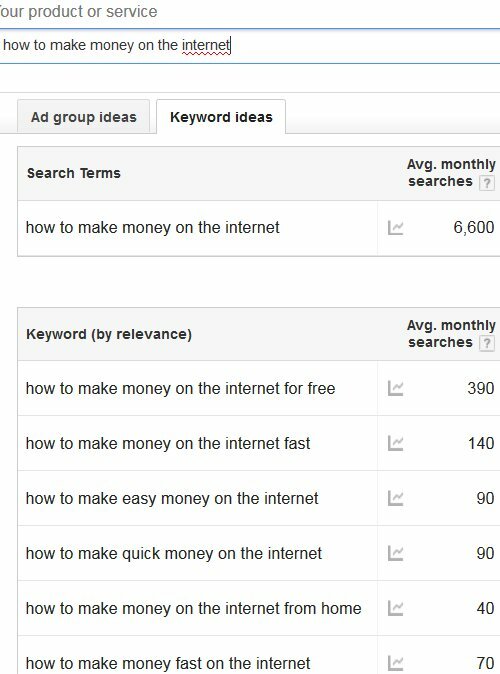 “How to Make Money on the Internet” is a long tail keyword SERP with 6,600 monthly searches. For a 7 word phrase that’s a nice chunk of traffic and ideal for this sort of SEO test! Even though it’s a long tail SERP there’s a lot of competition for the make money niche, so might be too difficult for a comment: the SEO Super Comments have decent on-page SEO, but by default only gain one internal backlink automatically, that is not a lot of SEO power. Note: there’s no built in way to add images to a comment like the image above, there’s probably a plugin for it, but I add the image to the main post and cut and paste the image code to the comment: it works :-) I don’t add images to every comment, a bit more SEO 101, the image filename is how-to-make-money-on-the-internet.jpg and the alt text is “How to Make Money on the Internet”. If you check Google AdWords Keywords Tool you can get a list of phrases related to this phrase. I could try to add these to this comment (mentioning free, fast, easy, quick, extra, home, UK could be enough for these SERPs**) or even write more comments to target them directly. ** We don’t need the exact phrase “how to make fast money on the internet” to target it, you could use part matches like ‘”how to make fast money” without breaking the bank’ and ‘”on the internet” I make loads of money’. Remember this isn’t just about gaining SERPs directly from the SEO Super Comment, we are supporting the main articles SERPs and that means if we target phrases related to the main article (the make money fast SERPs) because this comment is loaded on the main article it will add additional SEO. There’s also supporting SEO via the links on this comment, you can see we have a permalink link (see above where the comment date is) directly to this comment using the anchor text “How to Make Money on the Internet” and the link to the SEO Super Comment webpage with anchor text “How to Make Money on the Internet”. So we have two links off the main article using main keywords (Make Money) and related keywords like “How To” and “Internet”. Having the “How to” as anchor text off the main article could help the main article gain SERPs like “How to Make Money Fast” for example due to the partial match. On the SEO Super Comment page is a link back to the main article with keyword rich anchor text which means we have the SEO benefit of a keyword rich link back to the main article. Go to Make Money with Free Blogger Blogs, download the free BlogSpot template and use it on a free Blogger account to SEO and monetize with AdSense a free blog. The above even covers the “how to make money on the internet for free” long tail SERP. Wow this is an excellent article. You cannot find an SEO article like this anywhere on the internet and I have read most everything out there. I am wondering about these # are in the URLs. I don’t doubt for a second that they are for a good purpose it is just new to me and something you never see in other themes. I have so much work to do re-writing all my posts like this post. Pretty overwhelming. The #s in the URLs (called anchor tags) are taking advantage of an SEO fact very few SEO’s take advantage of. See Anchor Text SEO Tests for proof of what is discussed below. Google will only count the first links anchor text towards this webpages domain.tld/make-me-some-cash/ SERPs. There is probably a double SEO negative, might also be the anchor text doesn’t count as anchor text on the page the link is on either. Anchor text on a page has more SEO benefit than standard body text, impossible to SEO test, but could be the “Click Here” anchor text is the only text counted as anchor text and “Make Me Some Cash” and “Make Money Easily” could be treated as body text (still indexed and counted, but as body text rather than anchor text). As you can imagine that’s not good when you consider a lot of sites have a sitewide Homepage link with Home as the anchor text high in the code! By adding an anchor (that’s #something) to a URL it becomes a unique link to Google and Google counts it as a unique link. Simply making sure links 2, 3 etc… have #something added all the anchor text counts. Now all three links anchor text will count. You can also use this to stop links passing anchor text benefit. Because links one and two are identical only link one (as found in the code) counts, the “Click Here” anchor text is treated as body text, in effect the Click Here link doesn’t exist. Google would see a page with these three links as having two links to the home page with anchor text “Make Me Some Cash” and “Make Money Easily”. This SEO concept is built into Stallion Responsive for automated links (most widgets etc…). To use it inside a WordPress post I manually add the #something anchor. With this comment I added a link near the top and added the anchor #money to it so if there’s another link to tat webpage both links definitely count.